I like to keep an eye on the Microsoft 365 Roadmap to see what’s coming. 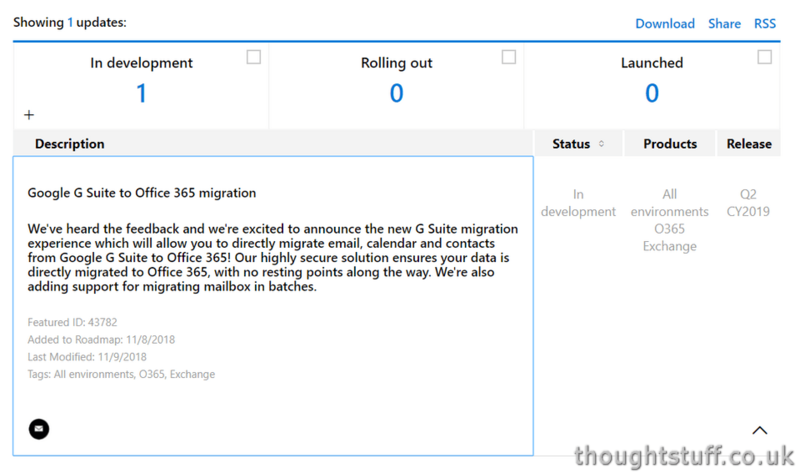 In the last few days, this new item was added: Google G Suite to Office 365 migration. Admins can already migrate IMAP mailboxes from G Suite using migration endpoints, but this doesn’t move contacts or calendar items. (users can move their own, but there’s no automated process). There are already third-party solutions out there for customers that want to migrate, but this looks like it will be an all-Microsoft offering. Crucially, Microsoft say that there will be “no resting points” in a “highly secure solution” – this will be good for businesses worried about data loss or leakage. Email, Calendar items and Contacts are specifically highlighted as items that can be migrated. There will also be support for migrating mailboxes in batches rather than all at once, which will be good for larger organisations that need to manage how users move, or need to provide user training and guidance along the way. Google already has a migration tool to move from Office 365, so it’s good to see Microsoft providing a similar service. The feature is still in development, with an estimated release date of Q2 2019.